Internships are a great opportunity to network with professionals in your industry, build skills for your resume and also learn more about yourself and what you want from your professional career. About 75% of college students complete an internship before graduation — a number that is rising due to the increasing evidence that internships are the most foolproof way to secure full time employment after graduation. Internships are competitive and if you want to be remembered you need to do more than just show up and do the minimum of what’s being asked of you. If you want to stand out and increase the likelihood of turning your internship into an opportunity for full time employment keep the following in mind. Be Punctual and Prepared: Think of your internship as an audition for the big play or a tryout for the varsity soccer team. You need to be on your “A” game from start to finish. This means showing up on time, well rested, dressed appropriately and prepared with all the materials you need to do what is expected of you. As an intern you are a guest of the company, do not make them regret welcoming you into their space. Prove yourself to be a reliable colleague and a valuable addition to the workplace by meeting your deadlines and coming prepared for anything. Pursue Excellence: Most likely your internship will come along with a variety of tasks, some that interest you and others that do not. The point is to approach each project with the same enthusiasm as the project that excites you the most. Even if a job seems easy, stay determined and do your best work. Everybody works differently and sometimes it takes a while for an employer to adjust to the time and efficiency of your work. If you find yourself finishing your work with extra time to spare do not just sit at your desk and surf the internet until the next task comes along. Be proactive, having extra time is the perfect opportunity to stand out and set yourself apart from other interns. Volunteer to do a project others don’t want or start working on something that needs to get done, but nobody has specifically asked you to do. By taking initiative and doing the unexpected, you will definitely give your employer something to remember. Be Independent: An internship is a learning experience, and just like taking a college course, it is highly unlikely you will coast through it without having questions and understanding how everything should be done. The difference, however, is that in a college class it is the teacher’s job to help you; during an internship it is your job to help your employer. Unlike in school, in the professional world there is such thing as a stupid question. If a question arises, do not run straight to your boss and ask the answer. Be resourceful. Most of the time the answer you are looking for can be found through internal company resources or answered by a fellow intern. Now, this doesn’t mean that you should not ask any questions. After all, your internship is an opportunity for you to learn and grow professionally. However, the questions you should ask should be well thought out, insightful and bring something new to the table that maybe your employer hadn’t thought of before. Thoughtful questions are always appreciated and will even set you apart from the competition. Just be careful not to be the intern who wastes valuable time asking for answers that you could have come to on your own. Build Relationships: When it comes to internships, networking is just as important as your official job responsibilities. Although it’s tempting and less frightening to only socialize with other interns, they won’t be any help come graduation time when you are frantically looking for a job. It can be intimidating but do your best to form strong relationships throughout your organization. Having mentors during your internship will not only help you to complete your job responsibilities effectively, but will also enhance your own personal growth. Establishing a meaningful relationship takes time and effort, and will not happen overnight. However, taking a network of contacts away from an internship will be extremely valuable to you not just after graduation, but for the entirety of your professional career. Document the Experience: Take the time to make note of what you are doing throughout your internship. You should try your best to jot down the tasks you completed every day, as well as how you felt about them. What did you do well? What did you struggle with? What excited you? What didn’t you enjoy? This will be a tremendous help when it’s time to add your internship experience to your resume. You will also learn more about yourself and more specifically, what you are looking for from your professional career in the future. An internship is the perfect opportunity to start building a professional portfolio. Listing coursework, experiences and strengths on a resume is not going to be enough to convince your future potential employers to hire you. For the most part, they want to see a physical product of your work and proof that you can walk the talk. Take the time to save the work you are proudest of. At the end of your internship, don’t be afraid to ask for letters of recommendation. By asking now as opposed to later when you actually need one, you will be saving yourself from the hardship of having to track down an individual willing to write one. 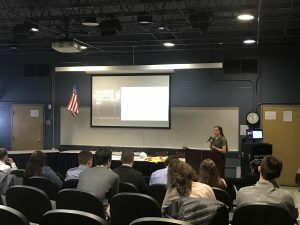 For most students, an internship serves as an introduction to the professional world, which is far different from the classroom. For that reason, as exciting as they are, internships can be nerve wracking and even overwhelming at times. Like all learning experiences, there will be both ups and downs, and it is important to remember not to let the downs discourage you. Sometimes things in life do not work out the way you expect them to. You may find, that you end up hating an internship that you thought you would love. Do not give up, at this point in your young career the experience is invaluable to you. Push through it, come prepared, go above and beyond in the work that you do and build lasting relationships. Love an internship or hate an internship, you are still creating experiences and learning more about yourself and what you want to gain from your professional career. 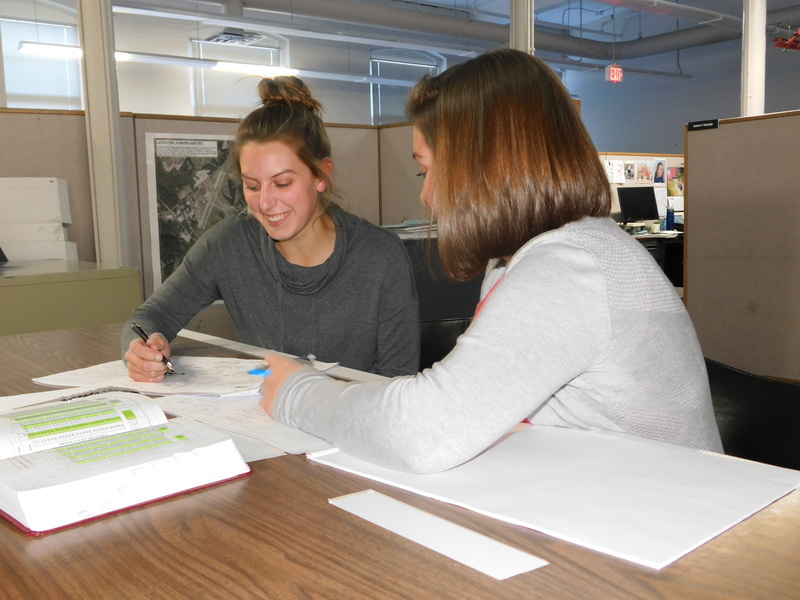 Hoyle, Tanner recently partnered with Milford (NH) High School & Applied Technology Center to host Stephanie Bishop, a high school senior, for the fall semester so she could further her passion for engineering. What inspired/influenced you to choose this career path: I love hands-on work. The whole design process from an idea to a sketch to an object seemed appealing to me. After taking the first engineering course at my high school, one project particularly stood out: paper bridges. I always wondered how bridges were able to hold so much weight. That curiosity combined with the knowledge gained from that unit in class, influenced my decision that civil engineering was the right path for me. Stephanie shares her internship experiences with her high school classmates. and wanted to continue with the subject. 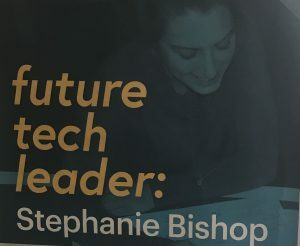 I got involved with STE(A)M nights as a student ambassador and got to share my knowledge and potentially spark an interest in younger kids. I wanted to know what other types of engineering were like so I joined the Women in Technology program with BAE Systems. This helped me gain an understanding of other options available should I decide that civil isn’t a right fit for me. I am currently in an internship with Hoyle, Tanner which is an amazing opportunity at the high school level to experience civil engineering first hand. 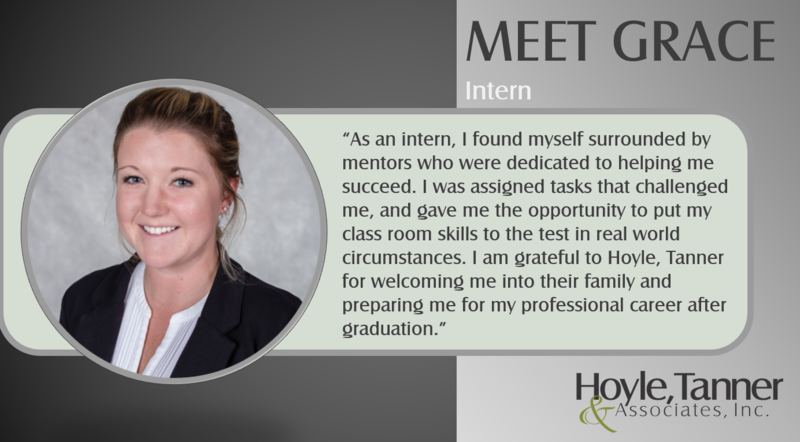 Tell me about your internship, what it involves, and who it’s with: My internship is with a private civil engineering firm called Hoyle, Tanner & Associates located in Manchester. I’m currently in the structures group which focuses on bridges but there’s also highway, environmental, and aviation groups within the firm. Being a structural engineer involves looking over blueprints, CAD drawings, quantities, load calculations, etc. To get out of the office you can also visit a job site and make sure everything is in check, which I’ve had the amazing opportunity to do within this internship. We wish Stephanie the best in her college career and look forward to potentially having her return to Hoyle, Tanner, as a full-time employee.